When Tom McMurtry landed the X-24B for the last time in November 1975, NASA's lifting-body program officially ended. Yet the legacy of wingless flight has lived on, continuing to have a significant impact on the design and technology of current and developing vehicles. In the 1980s and 1990s, the lifting-body legacy went international as Russia, Japan, and France began to design and test lifting bodies. During the early 1990s, the USA began to develop lifting-body designs for use as space-station transports, as spacecraft, and as a future replacement of the current Space Shuttle. Today, meanwhile, the original lifting-body vehicles flight-tested at the NASA Flight Research Center in the 1960s and early 1970s are all in museums, in outdoor mounted displays, or in the process of being restored for future public displays. The first lifting body-the M2-F1, fondly dubbed "the flying bathtub"-was stored outdoors at NASA Dryden for several years. It was damaged when it was blown over by the wind, but it is currently being restored. Several of the craftsmen who built the M2-F1 are contributing their time and labor in restoring it to its exact original condition. Eventually, the M2-F1 may join the M2-F3- the third lifting body, built from the crashed M2-F2- at the Smithsonian National Air and Space Museum in Washington, D.C., where the M2-F3 now hangs from the ceiling. The HL-10 is currently on display outdoors at NASA Dryden, mounted atop a pedestal. Earlier, the HL-10 had been severely damaged when it was dropped by a crane that was lifting it off a truck for display at the Los Angeles Museum of Science. The nose and vertical tails were smashed when the HL-10 hit the ground. Fortunately, no one was hurt in the accident. However, those of us who had worked on the lifting-body program were understandably upset with the Museum's crane crew and handlers, given the HL-10's illustrious flight-test record of 37 flights without mishap or damage. Jerry Reedy and his expert team in NASA Dryden's "Skunk Works" sheet-metal shop repaired the HL-10, doing the work in their spare time. Restored to its original condition, the HL-10 was carefully and sturdily mounted on its current pedestal display at NASA Dryden, never again to be lifted by a crane. For several years, the Hyper III was stored outdoors at NASA Dryden, along with the M2-F1. Fully restored by the Air Force, the Hyper III now hangs from the ceiling in the Air Museum at Castle Air Force Base near Merced, California. The X-24B is in the Air Force Museum at Wright Patterson Air Force Base in Dayton, Ohio. The original X-24A was converted into the X-24B, but to show what the X-24A looked like, a mocked-up SV-5J configured as the X-24A is displayed next to the X-24B. ASSET and PRIME, recovered following successful re-entries, are also displayed near the X-24B. The NASA lifting-body program has been well documented in about 100 technical reports on the program's 222 flights and 20,000 hours of wind-tunnel tests. Many of these publications are unclassified. The Soviet Union purchased copies of these reports from NASA Headquarters in Washington, D.C., then designed its own lifting body. In 1982, the Soviets flight-tested an unpiloted, 10-foot-long, subscale version of their lifting body, the BOR-4, including a maneuvering re-entry over the Indian Ocean from space orbit. The flight test of the BOR-4 closely resembled that of our PRIME (X-23) vehicle in 1966. The main difference between the two was that the BOR-4 was parachuted into the Indian Ocean for ship recovery, while the PRIME had been snatched from the air by a C-130 to avoid a splash down in the Pacific Ocean. There is no information available yet on whether the successor states of the former Soviet Union continued their work in the 1980s into larger-scale lifting bodies. Other than the Soviet flight experiments with the BOR-4, very little lifting-body design activity seems to have occurred in the 1980s. In the United States, the Shuttle satisfied all requirements for space flight. Even though the Soviets had built a copy of  our Shuttle, they flew it only once (unpiloted) and continued to rely on parachute recovery for their spacecraft. As the concept of an International Space Station emerged in the United States and other countries, however, interest revived in lifting-body configurations. Countries involved in or entering space exploration accepted that the International Space Station was required if mankind were to maintain a presence in space in preparing to send human beings to Mars and other planets or to revisit the moon. Smaller vehicles costing less to operate would be needed over many decades for the International Space Station. The small, compact shapes of lifting-body configurations began to show up on engineering sketch pads and drawing boards for use as space ferries or emergency lifeboats. Other countries entering the realm of space technology have also demonstrated interest in lifting bodies for various projected space missions. For example, the Japanese conducted hypersonic re-entry flight tests with parachute recovery during February 1997 of the HYFLEX, an unpiloted lifting body. The French also have indicated that they are doing mission studies using lifting bodies. 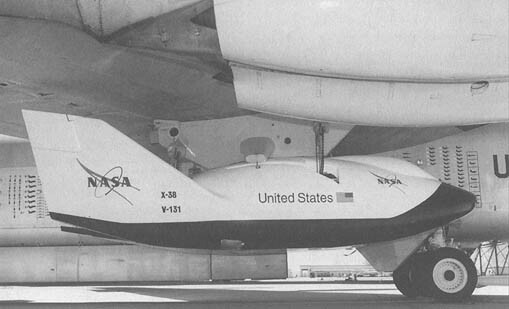 During 1990-1995, NASA Langley conducted studies on a new lifting-body shape designated the HL-20, designed to meet the projected need for a low-cost transportation system to ferry personnel between Earth and future space stations. 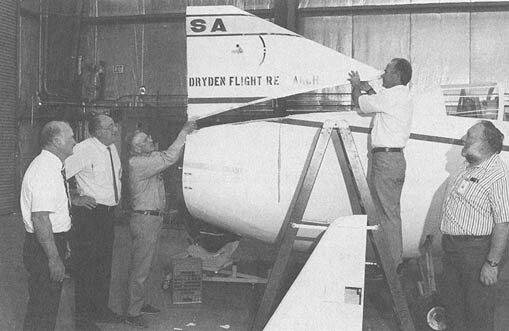 As part of the NASA Langley study, personnel at North Carolina Agricultural and Technical University and North Carolina State University built a full-scale mockup of the HL-20 in 1990. Designed to carry ten people into orbit and back, the HL-20 would be considerably smaller and lighter than the present Shuttle, the large size of the Shuttle being unnecessary for many of these future missions involved with transporting personnel to and from space stations and with delivering supplies to space stations. The projected HL-20 would be only 31 feet long and weigh 32,448 pounds, considerably smaller and lighter than the Shuttle, which is about 122 feet long and weighs over 171,000 pounds without its propellants, external tank, and solid rocket boosters. The HL-20 would be boosted into orbit by a Titan III rocket system, a system smaller than the Shuttle's rocket system. During the first half of the 1990s, while NASA Langley was conducting studies on the HL-20, several government organizations including NASA were conducting substantial studies on the design of a National AeroSpace Plane (NASP/X-30) capable of  taking off from an aircraft runway, flying into space, and returning to Earth, landing on an airport runway-all without the use of rocket boosters. Of the various configurations studied, a form of lifting body emerged which integrated a hypersonic air-breathing propulsion system within the vehicle's shape. However, the NASP study was terminated in 1994, when it was concluded that the high-temperature materials and air-breathing propulsion technology required for such prolonged high speeds within Earth's atmosphere would take many more years to mature than had originally been estimated. Nevertheless, NASA continued efforts on its own toward developing a space transportation system that would eventually replace the Shuttle. Opting to stay with rocket-propulsion systems, NASA required a design that would emphasize maximum efficiency, combining a very efficient single-stage-to-orbit vehicle with an advanced rocket-engine system built into the vehicle's shape. In 1994, NASA solicited proposals from the aerospace industry for designing and building a highly efficient single-stage-to-orbit vehicle to replace the Shuttle. Three proposals were submitted, one each from McDonnell Douglas, Rockwell AeroSpace, and Lockheed Martin. McDonnell Douglas submitted a proposal for a design of a lifting body that took off vertically and landed vertically on its tail. The design was reminiscent of Disneyland's Future Space Ride, where millions of tourists have sat in a simulator cabin watching a screen showing the spacecraft lifting off a launch pad and returning to the pad on landing, a procedure very similar to that shown in the Buck Rogers cartoons of the past. McDonnell Douglas built and flew a scale model of its proposed DC-X rocket to prove that it could indeed take off and land vertically on its tail. Rockwell AeroSpace proposed a design that was a conservative but highly refined remake of the current Shuttle. The proposed vehicle had wings, could be propelled into space vertically without drop-off boosters, and could land horizontally. By contrast, the design proposed by Lockheed Martin pushed the state-of-the-art in rocket propulsion, integrating a rocket motor design within the shape of a lifting-body spacecraft. NASA decided that this proposal reduced risk more than the other two alternatives. As a result, NASA awarded a contract valued at about $1 billion from 1996 through 2000 to the Lockheed Martin Skunk Works in Palmdale, California, for building and flight-testing the X-33, a 67-foot-long prototype model of the projected 127-foot-long VentureStar. 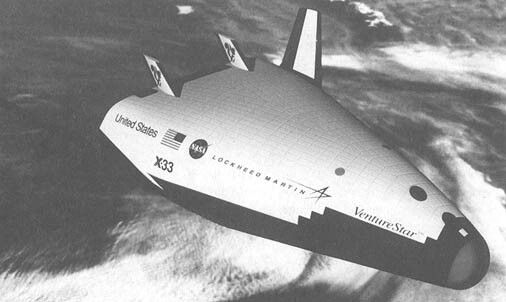 The X-33's empty weight will be about one-ninth that of VentureStar. The 2,186,000-pound lift-off weight of the proposed Venture-Star is about one-half of the 4,500,000-pound lift-off weight of the Shuttle. Wings were also eliminated during the design process. Although a lifting body is not as efficient as a winged aircraft at producing lift, the advantage of a lifting-body design for VentureStar is that-minus fuel and payload-the vehicle will be very light when landing back on Earth, light enough to land on an 8,000-foot-long runway, which is shorter than those found at most major airports today. Another significant feature of the lifting body is the large amount of storage area. The X-33 prototype as well as VentureStar will use the "aerospike" rocket engine developed by Rockwell's Rocketdyne Division of Canoga Park, California. Whereas conventional rocket engines have round bell-shaped nozzles, the aerospike engine uses the changing ambient air pressure as the rocket ascends to regulate the  shape of the exhaust plume. The conventional nozzle, on the other hand, operates at its highest level of efficiency only at a single altitude. In the 1960s, Rocketdyne developed a rounded aerospike nozzle, leading to the "linear aerospike" engine in 1972, with the gas stream exiting along the surface of a rectangular wedge rather than around a round spike-shape. Its designers hoped that NASA would use the new engine to power the Shuttle, but NASA opted at that time for a more conservative design. The engine fairly much sat on the shelf until Urie and his colleagues at Lockheed Martin mated it with a lifting-body design in creating the X-33 and VentureStar's initial designs. Seven of the linear aerospike engines will be arrayed across the entire trailing edge of VentureStar, the engines blending into the lifting-body shape. According to its designers, this arrangement will cause less drag in descent than that caused by a cluster of conventional engines. As with most rockets, VentureStar will be steered during ascent by vectoring engine thrust. However, unlike conventional rockets that move on gimbals, VentureStar's engines are fixed, the rockets' automatic flight-control system adjusting the throttle on each engine's upper and lower modules to steer the vehicle. Beneath the rocket's carbon-fiber skin, tanks on each side carry liquid hydrogen. A smaller tank in the nose contains liquid oxygen, which mixes with the hydrogen for combustion. Located in the middle of the vehicle is a 45-by-15-foot payload bay. Launching VentureStar should be dramatically different from today's space launches of the Shuttle, with considerably savings in time and materials as well as increased safety. VentureStar will not use the solid rocket boosters that, with the current Shuttle, must be fished out of the ocean and rebuilt after each Shuttle flight. Furthermore, VentureStar will use a metal heat shield, eliminating the 17,000 hours of between-flights maintenance currently involved in checking and replacing heat-resistant ceramic tiles on the outer surface of the Shuttle. Because of the large surface area of the lifting body, its designers expect VentureStar to re-enter Earth's atmosphere more gently than does the current Shuttle. Unlike the Shuttle's maneuvering thrusters, which use hypergolic propellants that ignite on contact with one another, VentureStar will use only liquid hydrogen and oxygen for propellants. Unlike the Shuttle, VentureStar will have no hydraulic system, using electrically powered flight controls, doors, and landing gears. Currently, Shuttle launches can be delayed when NASA engineers discover a glitch in a satellite payload already loaded onto the launcher. VentureStar bypasses this potential problem by using a self-contained canister as a payload bay. The satellite's manufacturer will load it into the canister, test it, and deliver it to the NASA launch site. The currently cumbersome job of assembling the Shuttle vehicle on a vertical tower is eliminated with VentureStar, for the vehicle will have no boosters or external tanks. This will allow VentureStar to be checked out in a hangar, like an airplane. Furthermore, VentureStar is expected to be safer than today's rockets, its design reducing the potential for catastrophic problems. While conventional rockets are doomed if an engine fails in flight, VentureStar's engines have a thrust reserve for emergency use. If one of VentureStar's seven engines should fail on liftoff, the engine opposite it would shut down to balance the spacecraft, the remaining five engines then throttling up to carry the vehicle safely into orbit. Employing a reusable rocket in the design of VentureStar is not only safer but friendlier to the environment. Its exhaust is comprised of water vapor, not the chemical wastes produced by a solid rocket, and there are no spent boosters to create a trail of debris behind the rocket. Flight-testing the X-33 prototype is expected to resolve certain critical issues before Lockheed Martin begins to build the full-scale VentureStar. For instance, although the X-33 will not fly to orbital speed, it will fly fast enough to test the aerodynamics and metal heat shield under realistic conditions. As in the X-15 and lifting-body programs between 1959 and 1975, NASA Dryden will play a major role in flight-testing the X-33. The plan is to begin flight-testing the X-33 at Edwards Air Force Base (AFB) in 1999. The X-33 is expected to reach Mach 3 on its first flight before landing at one of the small dry lakebeds northeast of Edwards AFB. Fifteen flight tests are planned at speeds up to Mach 15, mostly between Edwards AFB in Southern California and Malmstrom AFB near Great Falls, Montana. In 1992, I met up again with my old friend John Kiker at an annual international parachute conference in San Diego, California. Years ago at the NASA Johnson Space Center, Kiker had been responsible for developing the parachute systems used in the Gemini and Apollo programs. He had long since retired from NASA but was working part-time as a consultant to NASA on the design of parachute systems for spacecraft. Kiker introduced me at the conference to Rob Meyerson, the young engineer who at that time headed parachute research and development at the Johnson Space Center. Over lunch, Meyerson told me that there was interest at the Johnson Space Center in developing a lifeboat that would remain attached to the International Space Station for use in case of a need for emergency evacuation. Ideally, Meyerson said, the lifeboat would be totally automatic in flight, from de-orbit through re-entry and landing. Something more efficient than the Russian Soyuz two-to-three-person re-entry vehicle, recovered with a symmetrical parachute, was desirable. The ideal space-station lifeboat for Meyerson and his colleagues at the Johnson Space Center would use a guidance system allowing personnel to quickly punch landing coordinates into the lifeboat's onboard computer before or after boarding the vehicle. After the lifeboat had separated from the space station, onboard computers would fire the retro rockets at the right time during orbit for landing at the designated site on Earth. A lifting-body design would allow the lifeboat to fly during re-entry to a landing site 700 to 800 miles left or right of the orbital path. After the vehicle had decelerated to subsonic speed at about 20,000-feet altitude, a series of parachutes would be deployed-symmetrical deceleration chutes followed by a large, rectangular-shaped, gliding parafoil parachute. With a gliding ratio of about 3.5 to 1, the parafoil parachute could be steered left and right by two lines attached to winches inside the vehicle. Global Positioning System (GPS) satellites would provide navigation to the landing site. At an altitude of about 1,000 feet, the onboard computer would command a landing pattern with a downwind leg, base, and final approach into the wind. Using a sonar, radar, or laser altitude ground sensor, the computer would then command both winches to reel in the trailing edges of the parafoil parachute. Next, a landing flare maneuver would reduce the parachute sink rate from about twenty feet per second to less than five feet per second. With a parachute loading of about two pounds per square foot, the no-wind gliding speed would be about 40 miles per hour, slowing at touchdown to less than 30 miles per hour. Such low speed at landing would allow the vehicle to touch down off-runway, such as on any flat field free of obstacles. After Meyerson had related this information to me, I mentioned that I had been involved in some model flight tests of this concept in 1969 at the NASA Flight Research Center, except we had used the limp Rogallo Parawing gliding parachute with lifting-body shapes rather than the parafoil gliding parachute (see Chapter 8). Fascinated by the idea of GPS guidance, I told Meyerson that I would like to prove the concept by air-launching a lifting-body model as I had in 1969. After Meyerson returned to the Johnson Space Center, he had $150,000 sent to NASA Dryden so that I could put together a team to demonstrate the recovery concept using a subscale model. During the spring of 1992, we began the test program. By the end of summer, using a team of four and working part-time, we had achieved fully autonomous flight, including flared landing into the wind at a predetermined landing site in the Mojave Desert. Alex Sim served as NASA research project engineer. I did the design work and flight-planning. Jim Murray handled the electronics and data analysis. David Neufeld not only did the parachute rigging and packing but also served as radio-control pilot when the autonomous guiding system was disengaged during developmental flight-testing. Neufeld became so enthusiastic about his role as pilot that he took sky-diving lessons to learn more about controlling parafoil parachutes. He made only two static-line jumps during his sky-diving lessons, but both were stand-up landings in the center of the 600-foot circle used as a landing zone. I asked him why he hadn't made more jumps. He told me that he had learned from the two jumps all that he needed to learn about piloting the model, so why push his luck? To study the feasibility of the system, we used a flight model of a spacecraft in the generic shape of a flattened biconic (an object shaped like two cones with their bases together). The model weighted about 150 pounds and was flown under a commercial  ram-air parachute. Key elements of the system included GPS navigational guidance, flight-control computer, ultrasonic sensing for terminal altitude, electronic compass, and onboard data-recording. This was the first time I had worked with a fully autonomous air vehicle. I found myself talking to it as if I were coaching an onboard student pilot. As the model reached a planned turning point in the sky, I would say to it, "Now turn! Now turn!" As it approached for landing, I found myself telling it, "Now flare! Now flare!" Meyerson discussed the results of our model tests with John Muratore, an engineering colleague at the Johnson Space Center. Muratore had recently become famous for organizing a "pirate team" that developed a low-cost spacecraft control room by using personal computers. His control room had just been pressed into service to operate the Shuttle in flight, saving NASA millions of dollars through fewer controllers and substantially lower maintenance costs on computer and display systems. 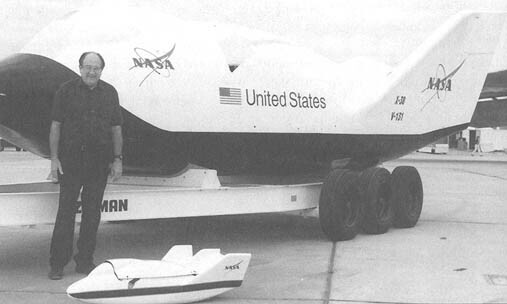 Muratore became very interested in the lifeboat concept and presented it to NASA Headquarters, enhancing his proposal by selecting a tried-and-proven lifting-body shape-that of the X-24A- for the lifeboat development program. The X-24A was the only lifting body that had been proven in flight from near-orbital speeds to horizontal landing. Although the unpiloted X-23 PRIME had demonstrated maneuvering flight from orbital speeds down to Mach 2, it was the X-24A that had then demonstrated flight from Mach 2 to subsonic landing speeds. His selection of the X-24A lifting-body shape also saved on costs, avoiding the need to develop a new spacecraft shape. NASA Headquarters bought the idea that Muratore would prove the concept in low-cost steps to help in making management decisions for later steps leading to launching a prototype into space. Muratore telephoned me to see what I thought about the proposal and stipulation, especially whether I thought NASA Dryden would be willing to support the Johnson Space Center in a low-cost, full-scale flight demonstration of the lifting-body parafoil-parachute-recovery concept. I said that during the lifting-body program, the NASA  Flight Research Center had spent twelve years proving lifting bodies in horizontal landing. 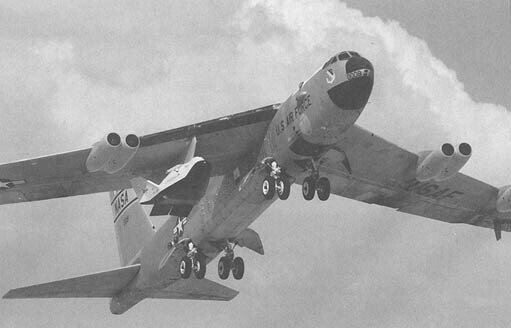 Consequently, NASA Dryden tended to be biased in favor of landing lifting bodies horizontally on runways rather than using a gliding-parachute landing. Later, during a telephone conference among Muratore, NASA Dryden director Ken Szalai, and Szalai's management staff, this bias became apparent, especially with Bill Dana, the world's most experienced lifting-body pilot, now serving as Szalai's chief engineer. Muratore explained to Szalai and the others that studies at the Johnson Space Center had clearly shown that the lifeboat concept utilizing parachute recovery was the most effective in cost and time for rescuing astronauts from the International Space Station. During the studies, Muratore's team had considered several different basic schemes, including a capsule and a horizontal-landing mini-shuttle. With a capsule, to land at an acceptable site, astronauts might have to wait as long as 18 hours in orbit, substantially increasing life-support requirements for the vehicle. With a mini-shuttle, on the other hand, the tail would lose control authority, "blanked" by the high angle of attack during re-entry into Earth's atmosphere, requiring complicated maneuvering engines. Muratore also explained the added costs involved with both the ocean recovery of parachuted capsules and the horizontal landing of high-speed lifting bodies. The first involves the high cost of maintaining ocean ships to rescue the capsules. The second involves the maintenance of long runway landing facilities. To keep lifting-body landing speeds low, Muratore explained that the vehicles would have to be either lighter or larger in size for the same weight. However, the larger lifting bodies would not be compatible with current rocket launch systems, such as the Ariane 5, Titan 4, and possibly the Atlas 2AS, DELTA 3, H-2, Proton D-1, or Zenit as well. The 24-foot-long X-24A, for instance, had usually landed after fuel exhaustion at a weight near 6,000 pounds, although Bill Dana said he once made an emergency landing in the M2-F3 with a gross weight of 10,000 pounds. To be compatible with boosters, Muratore said, the lifting-body spacecraft recovery vehicles must be kept small but weigh 16,000 pounds or more due to internal systems and payloads. A lifting body with such high density would normally require extremely high horizontal landing speeds, too high to be acceptable to Muratore's lifeboat designers. However, the use of a large parafoil gliding parachute could reduce landing speeds to a very low 40 miles per hour, opening up the potential for off-runway landings around the world. Szalai's team agreed to commit NASA Dryden to helping Muratore and the Johnson Space Center with the program. Szalai asked how Dryden could help. Muratore asked that it furnish and operate its B-52 for launching the Johnson Space Center's experimental vehicle at Edwards AFB. Szalai agreed. According to the agreement, Dryden would design and build a wing pylon so its B-52 could mothership the experimental vehicle aloft. Besides operating the B-52, Dryden would also furnish its ground and hangar facilities and be responsible for personnel  and range safety. Johnson Space Center, on the other hand, would be responsible for designing and fabricating the experimental vehicle or vehicles. In this way, a new lifting-body flight-test program-the X-38-came to NASA Dryden, its first in nearly twenty years. For building three full-scale fiberglass models of the X-38 lifting body, the Johnson Space Center contracted with Scaled Composites, Inc., Burt Rutan's little airplane factory in Mojave, California, not far from Edwards AFB. The three vehicles included one without fins for launching from a C-130 plus two with fins and control surfaces for launching from the B-52. In the spring of 1995, with the assistance of the Army, the first vehicle was launched from a C-130 over the parachute-testing range at Yuma, Arizona. An extraction chute pulled the finless lifting-body on an aluminum cargo pallet rearward from the C-130. Immediately after launch from the C-130, a problem developed with the cargo pallet and the parachute rigging. The pull from the extraction chute deformed the cargo pallet, causing parachute rigging deflections. Out-of-sequence line cutter and parachute deployments followed. The parachute system became entangled, and the first X-38 vehicle was destroyed on ground contact. Scaled Composites, Inc., completed the other two X-38s in the fall of 1996, delivering them to the Johnson Space Center for systems installation. Flight tests are planned to begin at NASA Dryden in the spring of 1997. By the end of 1997, it is hoped that a successful flight demonstration can be made-launching an X-38 from the B-52 at 45,000 feet, the X-38 then flying as a lifting body in controlled flight down to 20,000 feet, where a series of pilot chutes, drag chutes, and the large 7,300-square-foot parafoil gliding parachute will deploy. The X-38 would then be steered and flared autonomously to a landing site on the dry lakebed at Edwards AFB. Following successful flight demonstrations from B-52 launches, Muratore plans a follow-on vehicle built of aluminum with a shell of graphite-cyanate ester epoxy. Improved and larger Shuttle-derived blankets and tiles will provide thermal protection to the vehicle's stiffer composite structure. The plan is to launch this vehicle into orbit in 1999, using a yet-to-be-determined booster. After this vehicle is successfully recovered from orbit, the plan is to build four to eight mission vehicles designed to carry astronauts and service the International Space Station. Little did I know in 1962-as I was flying those paper models of lifting bodies in the hallways at NASA Dryden and later the first balsa models on a ranch east of Lancaster in California-that I would see major flight-test and spacecraft lifting-body programs come into being within the decade. Still less did I know then that, as these programs came into being, I would get to know and have the opportunity to work with the greatest minds and human spirits in aerospace-from designers of airplanes and spacecraft to the best pilots, flight crews, and technicians in the world. Our work during the 1960s and early 1970s in developing and flight-testing the first experimental lifting bodies has had a highly significant influence on decisions guiding the course of events in the space program. For instance, the decision to develop the Shuttle as an unpowered glider was heavily influenced by our flight experience at the NASA Flight Research Center with the lifting bodies. Because lifting-body landings had proved that unpowered landings were not only safe but reliable, the Shuttle design did not include the extra weight of deployable turbojet engines necessary for powered landings. The reduced weight increasing the Shuttle's carrying capacity significantly. There are now immediate and direct applications on the horizon for lifting-body vehicles. Although a lifting-body configuration has not yet emerged as an operational vehicle, that reality is getting very close and is now within sight. Wingless flight-both in and out of Earth's atmosphere-is now a firm and substantiated technology, thanks to the hard work and dedication of the men and women involved with the lifting-body concept during the 1950s, 1960s, and 1970s. Most of us who were involved at that time are today retired or nearing retirement, passing the legacy of wingless flight on to the next generation of engineers, scientists, technicians, pilots, and astronauts. Our legacy exists in detail for this new generation, recorded in numerous technical reports and flight-test records. The young engineers of today, who will carry flight innovation into the 21st century, can make solid and informed decisions in considering a wingless configuration for future space systems. In writing this book, I wished to give the new generation something that isn't always obvious when reading technical reports and flight-test records. I wanted them to know that those reports and records were produced by real people with very human feelings who shed much sweat, some tears, and even some blood in arriving at the facts and data that might seem coldly detached from human realities on the printed page. When I recall the very high risks we sometimes took during the twelve years of initial lifting-body history, I know for certain that we could have spilled much more blood than we did. I prefer to think that even as we were pushing things to the edge, we were smart enough not to fall off and needed only a little luck to protect us from ourselves. 1 See, e.g., Bill Sweetman, "Venture Star: 21st Century Space Shuttle," Popular Science (October 1996): 44; "Reusable Launch Vehicle," in Spinoff 1996 (Washington, D.C.: NASA, ): 30-31 for printed accounts of the X-33 and Venture Star plans, which were still in the developmental stages as this account was written. David Urie read this section for the author and expressed his satisfaction with its accuracy. In addition, Stephen D. Ishmael, Deputy Manager for X-33 Flight Test and Operations, representing NASA at the Lockheed Martin Skunk Works in Palmdale read the section and offered some changes that have been incorporated in the narrative. 2 Sweetman, "Venture Star," p. 46. 3 Sweetman, "Venture Star," p. 47; "Reusable Launch Vehicle," Spinoff 1996 , p. 31. 4 Alex G. Sim, James E. Murray, David Neufeld, and R. Dale Reed, The Development and Flight Test of a Deployable Precision Landing System for Spacecraft Recovery (Washington, D.C.: NASA TM 4525, 1993). Both John Muratore, NASA's X-38 project manager for the X-38 at the Johnson Space Center and William H. (Bill) Dana, Dryden's chief engineer and former lifting-body pilot, read this chapter, as did Gray Creech, science writer for Dryden's Aerospace Projects Directorate. The narrative has been improved in several places by their comments.